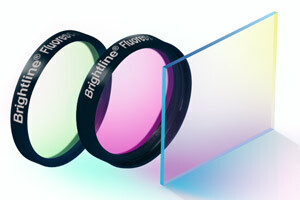 ROCHESTER, N.Y. – Semrock has just released four new BrightLine® long-pass fluorescence filter sets to enhance its full line of established high-performance bandpass filter sets. With these long-pass sets more fluorescence signal can be captured for low fluorophore concentration applications and when signal-to-noise ratio is not as critical. They are also well suited for viewing fluorophores with very wide emission spectra or with a large wavelength shift between the excitation and emission wavelengths. The new filter sets are targeted at imaging the most popular fluorophores including DAPI, GFP, and red fluorescent proteins such as mCherry. Two DAPI sets are available allowing users to choose between a narrowband excitation filter to minimize photobleaching and phototoxicity to the sample, and a wide exciter for maximum signal in very low-concentration samples. Users of current DAPI, GFP or mCherry BrightLine filter sets may quickly upgrade to long-pass sets by just dropping in the new long-pass emission filters purchased separately. All three emitters are guaranteed to offer > 93% average transmission over the passband and extremely steep edges that are perfect for capturing fluorescence as close to the excitation band as possible for maximum efficiency.